I’m quite enamored with just about everything craft related, but I get especially excited when I get to create a piece of jewelry or another type of accessory. I was so happy when Nicole was open to the idea of me sharing a jewelry-based DIY with you all, and I hope you enjoy it. And while the idea of making your own jewelry may sound a bit intimidating, I assure that if you’re even somewhat remotely ‘crafty’, you can create something for yourself with just a few basic items you can find at just about any craft store. Jade colored beads in multiple sizes (I used 3 different sizes), mono-filament jewelry wire (it looks just like fishing line), a package of jewelry chain, an all purpose pack of ‘jewelry findings’, which includes jump rings, crimping beads, lobster claw closures, and pin wires. You can buy all of these items in separate packages but if you’re a beginner or aren’t doing a lot of jewelry making, this all purpose pack is great. You also want to have a pair of scissors on hand, as well as a pair of needle nose pliers and wire cutters, which they sell on the cheap at a craft store, or you could always use a pair from your tool chest. Total supplies, if you include buying the tools, should run you less than $30. *Note that over the weekend I made this necklace again for a friend and this time I used a jewelry wire called Soft Flex in ultra fine. It was actually great to work with and because this necklace gets a little heavy, it is really sturdy and should hold up better over time. It is quite a bit more than mono-filament, but may be worth it in the end. Begin by cutting a length of your jewelry wire (roughly 18 inches), and string 1 of the crimp beads and a jump ring through the tail end of one side. Loop the wire over the jump ring and through the crimp bead again, creating a loop that is held together by the crimp bead. Gently but firmly squeeze the crimp bead shut with your needle nose pliers. There’s an actual bead crimper that they sell, but I’ve never had a problem closing my crimp beads shut with my pliers. You’re now ready to begin stringing your beads. Once you’ve completed one strand, close it off using the same method that you began with, using a crimp bead and jump ring. Your other 2 strand will now attach to this single jump ring. 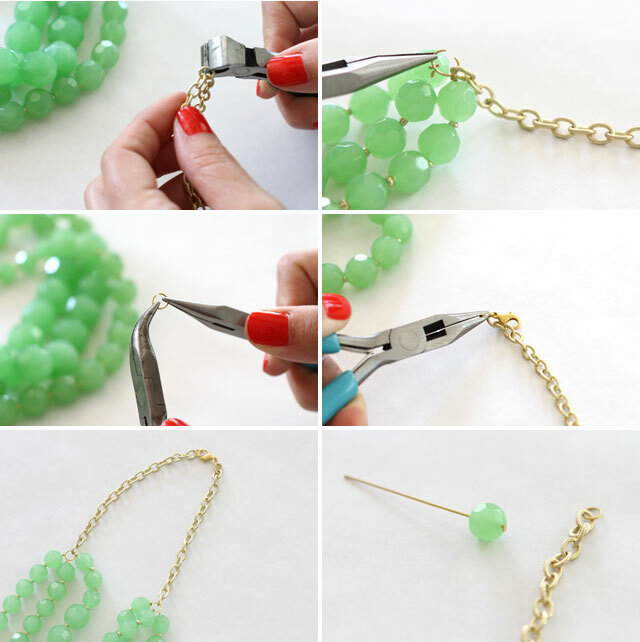 Trim the extra jewelry wire. Note that each strand will be approximately 14-15 inches long when finished. You don’t want all 3 strands to be exactly the same length so that they lay better on your neck. Since I’m not an actual jewelry designer and do this for fun, I always try to keep my designs relatively simple. I always love the look of mixed metals and gems, but I leave the real pattern mixing to the professionals, and stick to similar materials and tonal, or complementary, colors when creating something new. With this necklace, the only variations I made was to use a slightly different pattern with all three strands. One strand uses just the 2 smaller sized beads and has tiny gold seed beads spaced between each one. The other 2 strands contains a mixture of all 3 sizes, but in a slightly varying pattern. Once the body of your necklace is finished, it’s time to attach your chain. I think adding the chain creates a more finished look, and it also makes the necklace adjustable. Snip off 2 pieces of chain with your wire cutters. My chain is approximately 2.5″ long on each side. Attach each piece of chain to the jump ring on either side. A tip when opening and closing your jump rings; if you have 2 sets of small pliers on hand, gently pry each end apart, as shown, and then squeeze shut. This helps to maintain the shape of the ring, but it’s not necessary. Grab 2 more jump rings and attach it to the end of one chain, and attach it to the lobster claw and chain on the other end. Now you have your closure. If you’d like to really lend a finished look to your necklace, you could grab a sapre bead and attach it to one of the pin heads and then run it through a loop of chain and twist it shut, nipping off the end with your wire cutters, but this is not necessary. You’ve now finished your necklace and are ready to try it on! Total time to complete this necklace is 45 minutes or less, depending on your comfort level with working with the tools and beads. I tried the necklace on with a white tee, a chambray shirt, and this red dress, and it looked great with all three options, but I really love the way it pops against the red. Jewelry making is one of the most rewarding hobbies I have, and I hope this inspires you to give it a try. Please let me know if you have any questions. Beautiful!! Thanks for the great tutorial and beautiful step by step photos. I’ll definitely try this out soon! Love this necklace. Now I am tempted to try my hand at making a necklace! Okay, I think I can do this. Maybe we can get together and make one or two? Lovely necklace! I dabbled with jewelery making a long time ago, mostly earrings but I was never happy with the quality of wires I got from Micheal’s. Do you know of any online resource? I am motivated to get back into making some jewelery for myself. Beautiful tutorial with lovely photos! Love the green. I read this question and also wanted to suggest etsy.com as a source for jewelry supplies. I’ve found some unique stuff and the prices are about as competitive as anywhere else! LOVE LOVE LOVE this necklace! 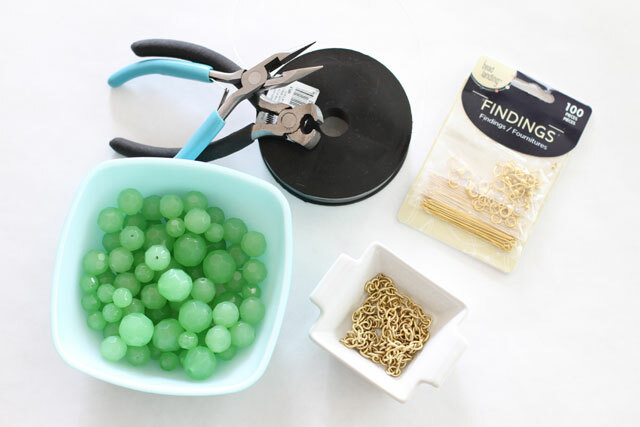 I was just at Michaels today and had these exact beads in my hand but decided to research how to make a neclace first and then i happen to come across your blog! Questions: I also only found one size in those beads, did you get them all at Michaels? Also, how many strands of each size of beads do you think i need to make this? Oh I wish I had the time right now to open a shop! But with 2 blogs going, and baby #3 on the way I’m afraid not :) Maybe someday soon though! I promise this is very easy to make though! Do you have a esty.com account? This might just be doable for a novice like me. And it’s gorgeous. Also, where is the red dress from? The detailing looks beautiful. I, too, love how it pops against the red!!! I’d love to make some of these!! I’ve only made 3 bracelets so far! Super simple ones, I like that when you get started it begins to get cheaper as you already have the bits and pieces so you don’t have to keep buying pliers etc. Really want to make earrings! I love your nail color (especially in contrast to the green beads). I’ve been wanting to find a nice orangey red. Can you share the shade if you know it? Love this project! Where did you get the beads? I have the toughest time trying to find beads in pretty colors. Okay, so not a look I’m gonna pull off. Well, at least not without plenty of raised eyebrows. But, what a fantastic DIY! Reasonably easy and super chic. Awesome! I love this necklace. I have been looking for something like this to make to go along with a maxi skirt that I am making. I will be making this for sure and will let you know how it goes. Thanks again! I LOVE this necklace!! Can’t wait to try one just like it!! Could you give us an estimate of the cost? Thanks so much for your lovely post!*:. Love it! Totally attempting. I second the nail polish inquiry. Soo pretty! I’ve always wanted to try jewelry making and I think this might give me the push I’ve been needing! 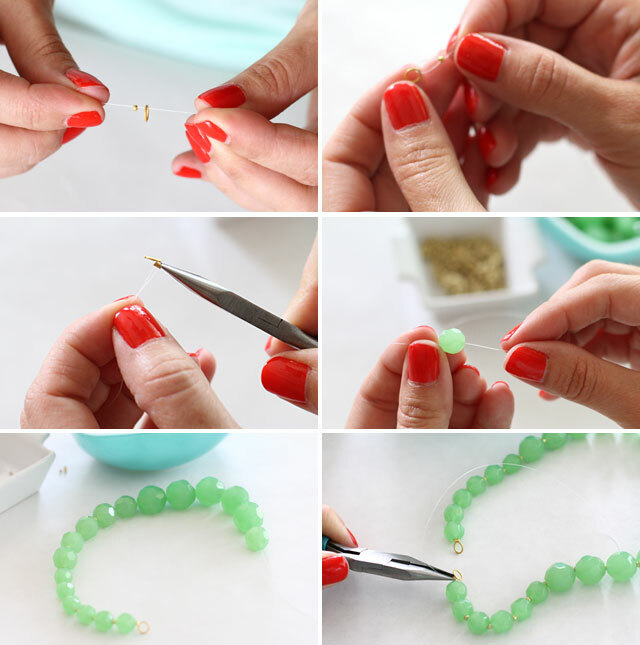 excellent tutorial – this will help me re-string some of the broken down vintage beads/necklaces from my grandma too! I love this idea. i love everything about it – i’m totally going to spend the weekend making some statement necklances!!!! i’ll post some pics so you can see. I love it!!! Such a beautiful color. I LOVE this necklace and I never feel inspired to DIY jewelry, but I am going to make this. It’s beautiful! I love this necklace! Thanks for the tutorial! I am going to have to make a few of these for summer! Nicole, you look so fit! I know a while back you did some posts that included how you were changing your diet. I wish you would do an update. I like that you had a sensible approach, and would love to know how you fit fitness and healthy eating into your daily life. Especially since you are so busy! Oops! Forgot to mention that I love that necklace! I am inspired to try and make one myself. Wow! Great tutorial and I LOVE the finished product! I’ve been meaning to give jewelry making a try since my love of statement jewelry doesn’t exactly jive with my bank account balance… this post just pushed me over the edge and I’ll be hitting the craft store tomorrow to pick up any missing supplies. Hi Linda! Thank you for the well wishes! Yes, the beads in between were gold seed beads, available just about anywhere :) I only used them between the small and medium size beads because they just got swallowed up by the larger bead. Let me know if you have anymore questions! I am trying to make this but went to two Michael’s and could only find two sizes of beads. 14mm and 10mm. Any idea where I might be able to find the 12mm or are they sold only at Michael’s? Oooooh I love! Def going to be making this next week while I am on stay-cation! Happy Friday!! | Invincible Inc.
Looks amazing and I LOVE it with the red top, great color combo! Wow, I’m impressed! Love the colors, and this looks AWESOME and maaaaaybe like something I could do. I almost never make jewelry but would love one of these! And I’m hitting up JoAnn today, so I’ll take a look at the bead aisle and see how intimidated I get…. thanks for the lovely tutorial! 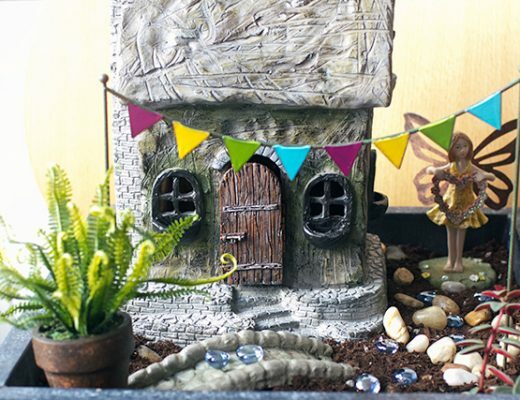 Thanks for sharing this wonderful project,Where did you bought the beautiful color beads?? Can you sharing a place where we can buy online? Thanks so much! This certainly is a statement necklace and perfect for the summer! Thanks for teaching me how to make one! This is such a stunning necklace – great colour! I remember making necklaces when I was a kid and how fun it was. Although mine were much more simple I agree they are super easy! Once you’ve made one your possibilities are unlimited! This one is beautiful and goes with just about any color. One great thing about buying the supplies at Michaels is the great coupon offers they have. You can get just about everything for half price. Thanks for reinspiring me to make beautiful necklaces again! Mine took me closer to 2 hours, but for a novice, it was an easy project & now I have the confidence (& supplies)to try making more jewelry! Thank you for sharing! Thanks so much!! I made this yesterday and it turned out FANTASTIC!! I love it so much!! However, it took way longer than 45 minutes (at least 2 hours) but so worth it!! I haven’t done any beading for more than 15 years and that was all super basic, what a great introduction I’m sure I’ll be making more! Thanks for the tutorial. Maybe someday I’ll make one! Thats amazing! Do you have an etsy.com account? Thank you SO MUCH for this tutorial, I was so inspired, I made three necklaces, including the one you showcased here. While I don’t think I’ll be opening up an etsy shop anytime soon, thanks for showing me how easy it is. Now I don’t have to covet those JCrew pieces quite so much :)! 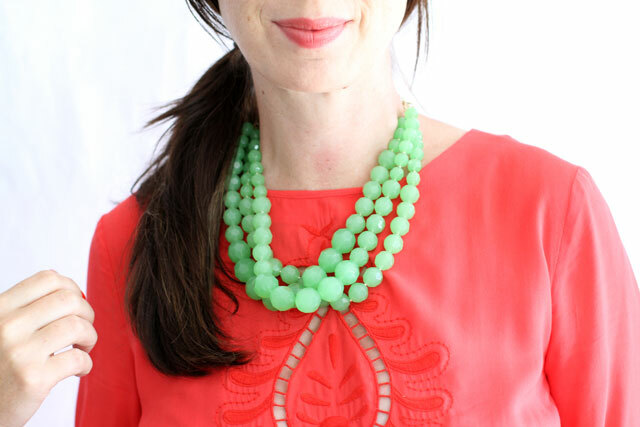 Hello Andrea, this is a lovely necklace tutorial and i love the finished product . i made one now . i am really fond of craft and i loved ur blog i too have an idea of making a ring would u like to try ? Hi… beautiful design! 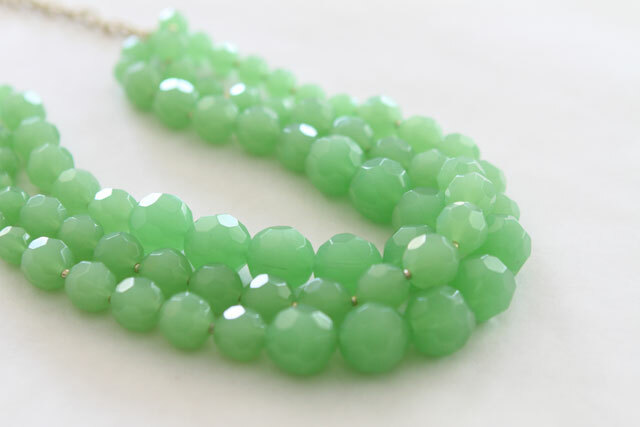 I love the color of the beads :) I make jewelry for fun too… I find it relaxing actually… I will definitely try this some time! Hi! Love this necklace! What’s the estimated price for a necklace like this minus the tools? I found this on Pinterest and made my own :) Thanks for the help and inspiration! 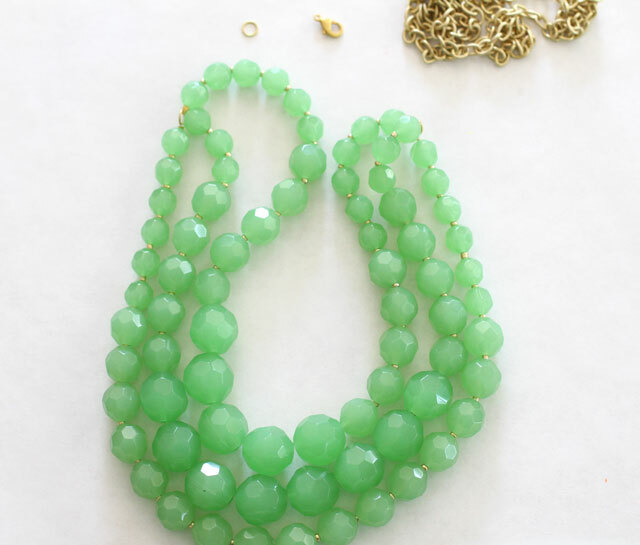 is this jade statement necklace for sale? I would really like to order one for purchase. 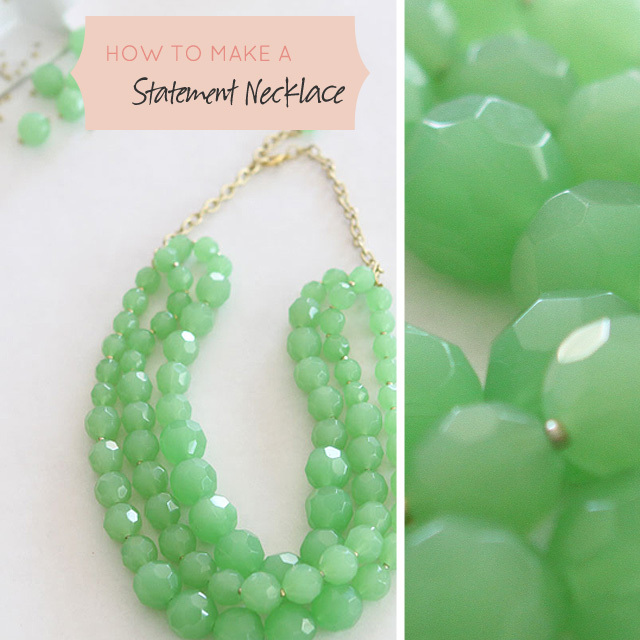 I’ve been looking for something like this jade green statement necklace for a few weeks now and I can’t find anything, until I came across this tutorial. Only I want to purchase it. What a beautiful necklace and looks easy enough to do. In fact, going to try it….thanks again for the tutorial. I love making necklaces. I am a novice, so I do not know much about jewelry making. But, the only problem I keep having is that the necklaces keep breaking after a couple of times wearing it. How do you know if certain string or clamps are not strong enough for certain designs? Do you experience similar problems? What kinds of wires and or clamps do you use? I love this! I was wondering if there was anyway to incorporate fancy-colored diamonds into this kind of necklace. I love the idea of a statement necklace, but would really like to keep the diamond aspect. They remind me a lot of my grandmother and the jewelry she would make me as a child. Thanks for this beautiful guide! Just a fast comment to say just post. Just interested.. did you design the blog design yourself? I love this tutorial! I am starting an online shop selling jewelry, and this necklace tutorial is EXACTLY what I wanted for ideas. Thank you so much!